The National Public Health Information Coalition awarded the North Dakota Department of Health the Gold Award of Excellence in Public Health Communication for the Women's Way Calendar described. 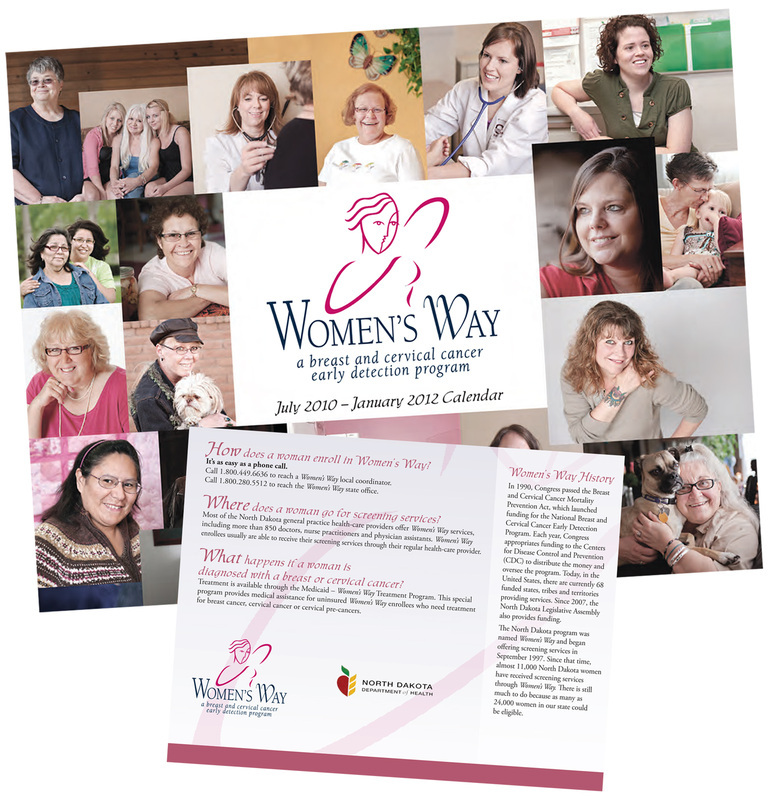 Women’s Way, a breast and cervical cancer early detection program, awarded the bid to Reach Partners, Inc. to project manage the creation of a 19- month calendar featuring photographs and stories from women around the state of North Dakota. From start, to delivering print-ready files, the project timeline allowed six weeks to photograph, write and design the files for 7,000 printed calendars. Reach Partners served as the project manager, which included handling and staying within the budget, scheduling photo shoots, management of the graphic designer and multiple meetings with the client to ensure they received a quality final project that met or exceeded their expectations. Women photographed included clients of the program and service providers Reach Partners had the challenge of scheduling three statewide trips for the photographer who shot photographs of 19 women and headshots 11 case workers. Reach Partners was committed to capturing the women in their own environments, rather than having all of the women travel to a studio to be photographed. Reach Partners pulled in the right team for a project that needed precise scheduling and professional, high quality work. Reach Partners has working relationships with other professionals who provide quality services, so the best photographer, writer and graphic designer jumped on board for the project. The project was completed within the deadline and delivered to the client for printing. Reach Partners has coordinated many types of special projects for a variety of clients. The role of Reach Partners has ranged from managing projects start to finish, managing the printing process of projects and the distribution of print pieces, to handling the distribution piece for public service announcements in a variety of formats for radio and television stations.